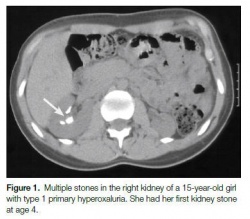 Oxalosis is a rare metabolic disorder in which the kidneys are unable to eliminate calcium oxalate crystals through the urine. Oxalate is a by-product of normal metabolism. There are no enzymes in the human body that can break down oxalate. 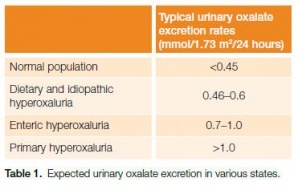 Oxalate must be excreted from the body through urine. The excess crystals then collect in other parts of the body, accumulating first in the blood, then the eyes, bones, muscles, blood vessels, heart and other major organs. If untreated Oxalosis can lead to death. Oxalosis caused by Primary Hyperoxaluria occurs in about 1 to 3 per million people. 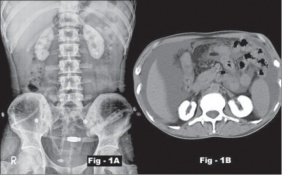 Secondary Hyperoxaluria is less common and the prevalence of Oxalosis due to this diagnosis is unknown. Oxalosis is more common in Mediterranean countries. 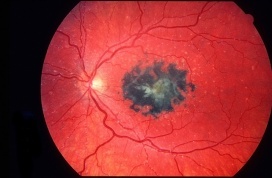 Crystalline retinopathy in oxalosis as a result of calcium oxalate deposits in the retina; also deposition in RPE which causes fleck retina as pigmentary lesion in the center. Vitamins and minerals can help to reduce or prevent oxalate accumulation in the body. Vitamin B-6 can reduce oxalate excreted in the urine and oral preparations of phosphates and citrate can help prevent oxalate crystals from developing. Other medications (i.e thiazide diuretics) may be necessary contingent upon abnormalities in the urine. For patients diagnosed with primary hyperoxaluria prescription doses of pyridoxine have been shown to decrease urine oxalate levels significantly in some cases. Urine oxalate levels in individuals on pyridoxine should be monitored monthly to assess individual patient responsiveness to this drug. Symptoms due to oxalosis-induced oxalate arthritis have been shown to be alleviated through the utilization of NSAIDS, colchicine and steroids. However, side effects have been noticed with the use of such medications. Some forms of these medications are not advised to use for certain patients, depending upon the primary cause and progression of the condition. e in the urine and blood as well as kidney function. An X-ray, CT scan or ultrasound can be used to determine if kidney stones and calcium oxalate deposits are present. Once kidney stones are passed/extracted the makeup can be analyzed. If these tests are positive for possible hyperoxaluria then genetic testing may be indicated. Further testing may include biopsies of the kidneys and bone marrow to assess for oxalate deposits as well as biopsy of the liver to check deficient production of liver enzymes. An echocardiogram may be performed to check for oxalate accumulation in the heart and an eye exam may be necessary to evaluate for oxalate deposits in the eyes. An arthrocentesis and synovial fluid analysis will be required to diagnosis oxalate arthritis. Hyperoxaluria: Condition in which there is too much Oxalate in the urine. Excess oxalate can bind to calcium in the urine and cause kidney stones. Primary Hyperoxaluria (PH): A rare, genetic disorder in which the liver can’t create the enzyme (or the enzyme doesn’t work properly) responsible for regulating the production of oxalate. An increase in the production of oxalate causes excessive amounts to be excreted in the urine. Oxalate can then combine with calcium in the urine and form salt or crystals that often results in lethal damage to the kidneys. The enzymes involved in this disorder are listed below. Enteric Hyperoxaluria: Certain intestinal diseases (Crohn's_Disease and Short Bowel Syndrome) can cause an increase in absorption of oxalate from foods therefore increasing the oxalate excreted in the urine. Kidney failure due to reasons other than Hyperoxaluria in which oxalate can no longer be excreted from the body. Once the kidneys are no longer able to keep up with excretion of oxalate, the crystals begin to accumulate in the blood. Once the oxalate crystals begin circulating in the blood stream, they are free to deposit into other structures of the body. Most bodily systems can be affected by oxalate accumulation. Due to the vast structures that can be affected by oxalosis, the disease can become fatal when accumulation becomes excessive. Structures commonly affected by the disease are listed in the definition and clinical presentation sections above. Treatment will depend on the type, symptoms and severity of hyperoxaluria and how well you respond to treatment. Medications: View Medications section above. High fluid intake: If kidney function has not been impaired, increasing your fluid intake will help to flush the kidneys, stop oxalate build up and prevent kidney stones. Calcium Oxalate kidney stones occur commonly with hyperoxaluria, but do not always require treatment. If treatment is deemed necessary there are several minimally invasive options to eliminate kidney stones. Shock Wave Lithotripsy: A procedure completed by a urologist in which a lithotripter is used to break the kidney stone into small pieces. Ureteroscopy: A procedure in which a ureteroscope is used to find and remove the stone or break up the stone with laser energy. Also performed by a urologist. Percutaneous Nephrolithotomy: A procedure in which a small incision is made in the patient’s back, and a nephroscope is used by the urologist to find and retrieve the stone. Dialysis is a treatment that is used to compensate for kidney failure caused by Hyperoxaluria. It imitates kidney function by removing extra fluids and toxins from the blood. Dialysis is only a temporary solution while awaiting a kidney transplant because it cannot eliminate oxalate that accumulates elsewhere in the body and eventually oxalosis will result. Hemodialysis: A procedure that involves removing blood from the body and into a dialyzer that filters the blood to remove toxins. The newly cleansed blood is then returned to the body. This process takes 3-5 hours and is performed at least 3 times per week. Once the kidney fails a transplant may be needed. Based on the type and progression of the disease process a kidney transplant or kidney and liver transplant based on individual disease presentation may be required. Physical therapy is currently not recognized as a primary method of treatment for oxalosis. Current management of the condition is listed in sections above. However, physical therapy treatment may be indicated to address the functional limitations and impairments that a patient develops from excessive oxalate accumulation. As mentioned above, oxalosis may lead to excessive skeletal oxalate accumulation. If profound, these affected skeletal structures may be prone to fractures and demineralization. Physical therapy treatment would be needed to rehabilitate patients post surgical correction. For patients who suffer from oxalate arthritis, symptoms such as pain quite possibly may disappear once the cause of the oxalate production are addressed. However, some patients who are apprehensive to movement displaying reduced range of motion and strength deficits, would benefit from physical therapy to address such limitations. Besides addressing range of motion and strength, physical therapy treatment may focus on joint protection strategies, as well as energy conservation techniques. All other movement based dysfunctions that are the direct result of oxalosis, can be addressed through evidence based physical therapy treatment, as long as the cause of the primary condition is corrected. Facebook page: Primary Hyperoxaluria Disease-Mayo Clinic: Contains information and tips about kidney stones, kidney stone prevention and management, and hyperoxaluria, and notifications about upcoming meetings and conferences.